Back to school is now in full swing. Here are 9 fun lunchbox ideas to help you pack fun, filling, and creative lunchboxes throughout the school year. 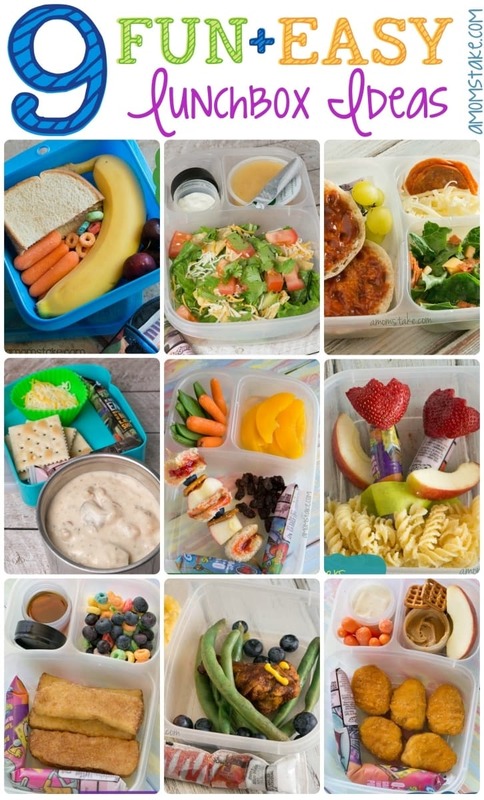 Even if you have just minutes to throw together lunch, many of these lunchbox ideas can be made and will encourage your child to try new fruits and vegetables and have variety in their meals! This blooming flower lunchbox starts with a Go-Gurt flower stem and a large strawberry cut in half to make two tulip bulbs. Add apples slices as leaves. Use a rubber band or piece of tape to hold the Go-Gurt tight in a V-shape. Next, add a field of springy rotini noodles lightly buttered and sprinkled with parmesan cheese. Add more flowers with thinly sliced cucumbers and a peeled mandarin orange. We often excuse having breakfast for dinner and breakfast for brunch — why not serve a brunch lunch? At my boys school, lunch comes so early it’s typically at a brunch hour, anyways. 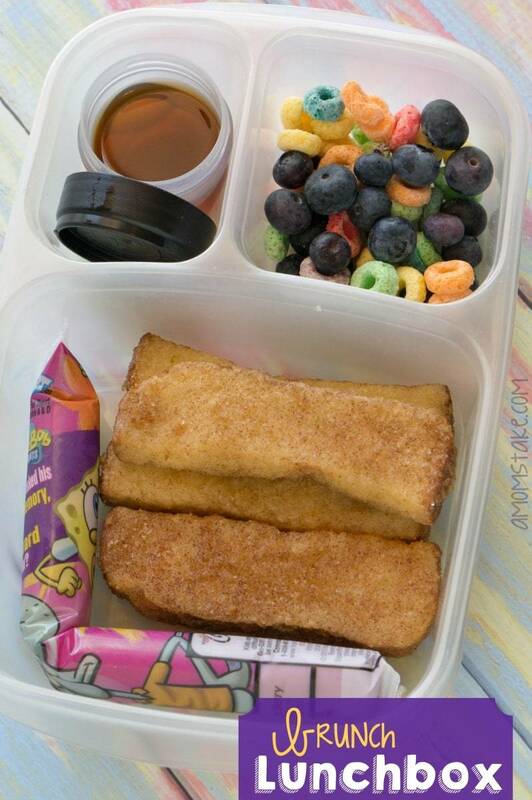 This fun lunchbox was filled with french toast sticks and a dipping container with syrup – but you could use powdered sugar, sugar, honey, or leave the french toast plain. Add a blueberry and Fruity Cheerios “salad” as a fun side dish and a Go-Gurt to complete your lunchbox. Kids love to create their own lunch! 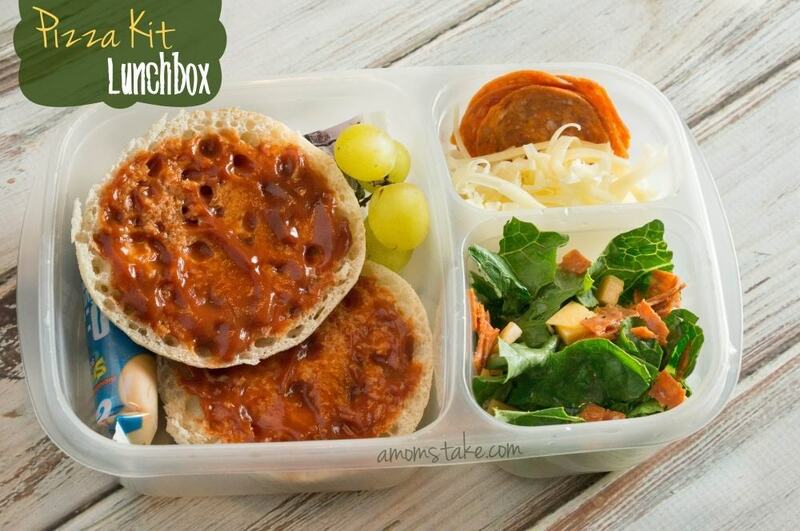 Give them a pizza kit lunchbox by slicing an english muffin in half. Top the English muffin with a small spoonful of pizza sauce, if desired, or leave it plain. Store the muffins stuck together for travel so the sauce doesn’t make a mess. Add in shredded mozzarella cheese and pepperoni or their favorite toppings. The mini pizzas can be served cold or cooked for a quick 20-30 seconds if a microwave is available. Add a side salad with diced cheese, diced pepperoni, and a dash of Italian dressing. Round-out their lunchbox with a Go-Gurt and grapes to complete the meal. This lunch is all about being a bit wild! It is totally okay to think outside the box and include different foods than you normally do or present your usual picks in a whole new way. I took a PB&J sandwich and cut it into small cubes. Then, I grabbed a skewer and broke it to fit my lunchbox size. Then, I alternated sandwich bites, apple bites, pretzel squares, and a blueberry until the skewer was filled. 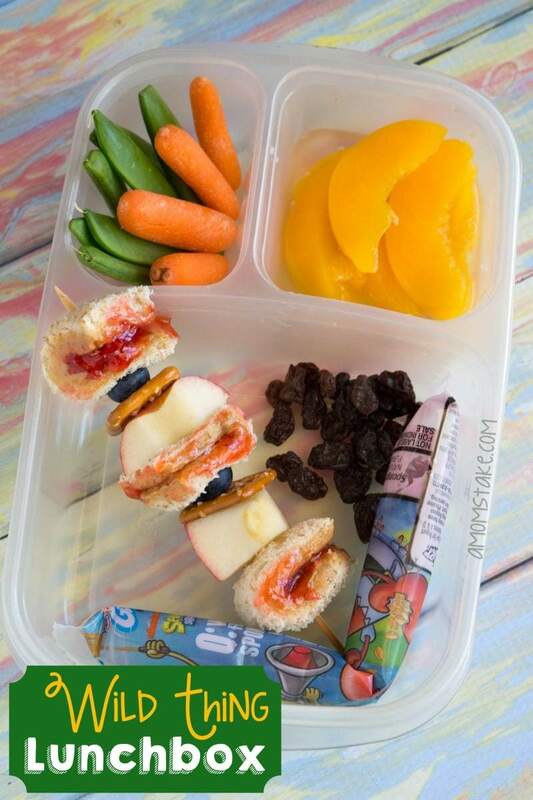 Next, add raisins, peaches, baby carrots, and pea pods to the lunchbox. Finally, add a Go-Gurt for a healthy dairy serving. 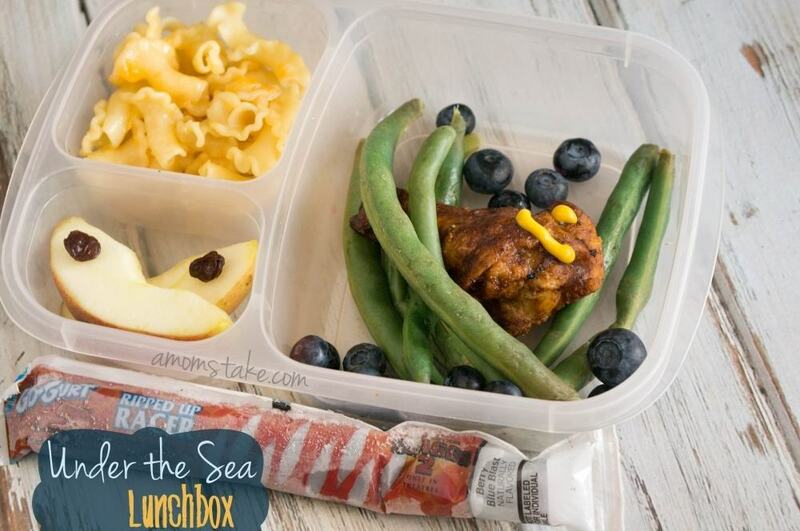 Set on an underwater adventure with this cute under the sea lunchbox theme! Start with a crazy noodle pasta salad with melted cheese to resemble coral. Add a cold chicken drumstick “whale” and add to the scene with green bean seaweed and blueberry bubbles. Add in a frozen blue Go-Gurt to add to the theme and apple slice “fish” with a raisin eye. When it’s cold or stormy out, nothing will warm and comfort your child like a bowl of soup! You can warm up their favorite soup at home and then fill up a thermos to keep in the warmth until lunchtime. Add more fun to lunch by packing extras that your child can add to their soup like crackers and grated cheese. Add in a Go-Gurt to complete the meal. 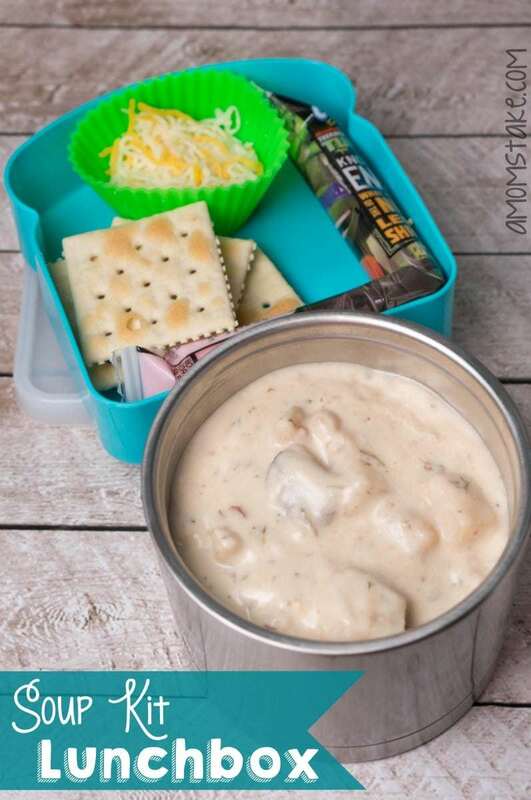 Kids always love to dip, and this lunchbox is all around having fun with dipping! 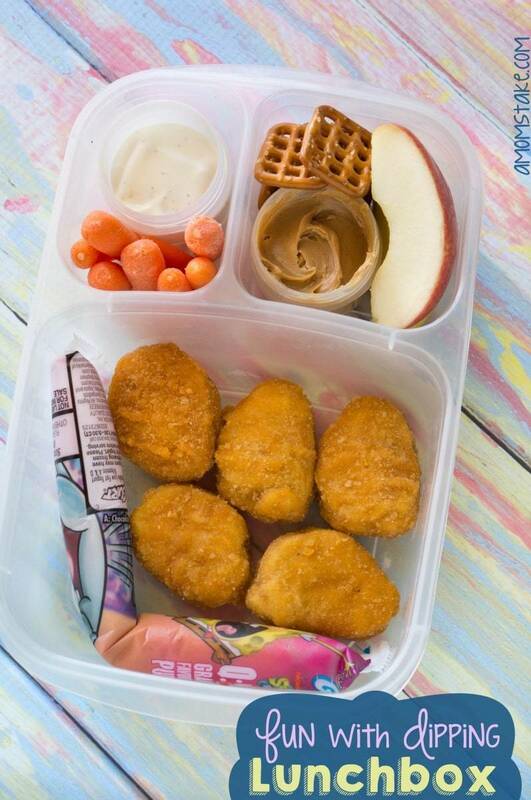 Start with chicken nuggets and baby carrots with a small dipping container of ranch dressing. Next, add in a dipping cup of peanut butter with apple slices and pretzels. Finally, round off the lunchbox with a Go-Gurt! My boys will always gobble up more of their lunch when they get to dip and have fun while they are eating, it’s a win-win! There is a mis-conception that fun lunchboxes are difficult to put together. This extra simple lunchbox proves you can make lunch look fun and appealing while sticking to the basics. For this lunchbox, I crammed full a small container which makes lunch look excited with all the colors aligned together. Start with a whole banana in your lunch container so it doesn’t get smashed on the way to school. Next, slice a basic PB&J in half and stack it on top of each other on one side of your lunchbox. 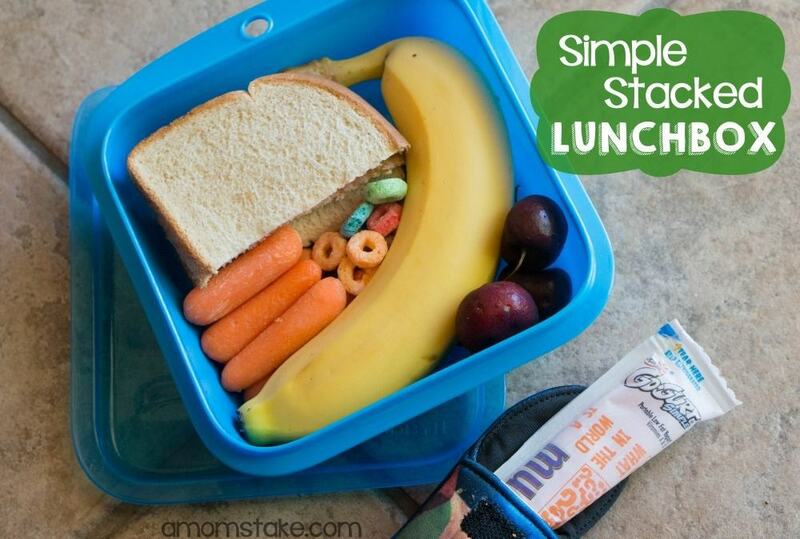 Next, stack cherries, baby carrots, Fruity Cheerios, or other favorite lunchbox items to add to your them. Seal up the lunchbox and then add a frozen Go-Gurt in a insulated pouch. 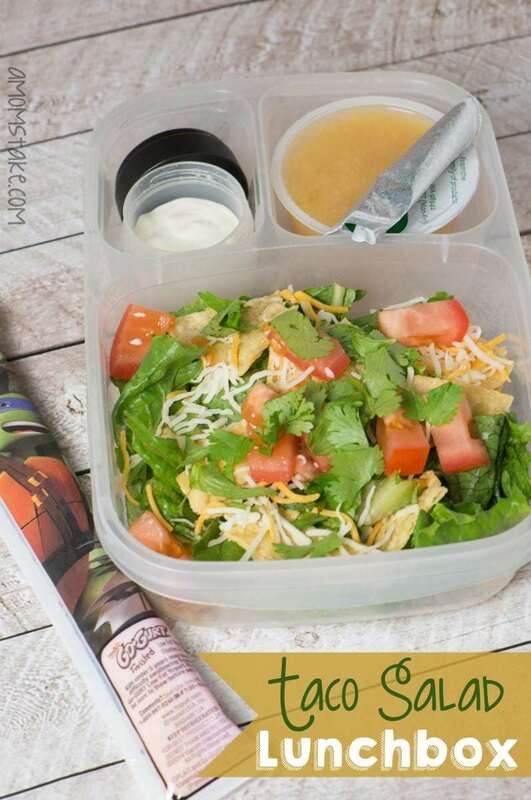 Make a salad fun by making a taco salad kit for lunch! Start with a layer of tortilla chips at the bottom of your lunchbox and then add chopped lettuce, diced tomatoes, grated cheese, and even a pinch of parsley if they like it. Store their favorite salad dressing in a small container on the side so the salad stays fresh. Plus, kids always love to do this step themselves! Finish off the meal with a few healthy sides and you’ve got a simple lunch that’s very tasty! No matter what you choose to serve up for lunch, adding in a Go-Gurt is an easy way to sneak in dairy. What other fun lunchbox ideas do you have? Those are some great lunchbox ideas. I will have to use them for my daughter sometime. Thank you! I needed some new ideas. I love the pizza idea and the blueberries with cereal is a great idea. My kids take cereal all the time, but we’ve never added berries to it. Those are some great lunch ideas. What kid wouldn’t want to eat healthy with cool designs like that. These are so adorable! It really makes me wish my kids were tiny again so I could try a few. Great ideas! I used to cut the girls sandwiches with cookie cutters. I’d give them hearts and butterflies. Fun! They loved it! These are SOME really cute ideas… I really like the Pizza Kit Lunch Box idea..
Great ideas! I love finding new ideas! Saves me time trying to figure out what to pack every day! 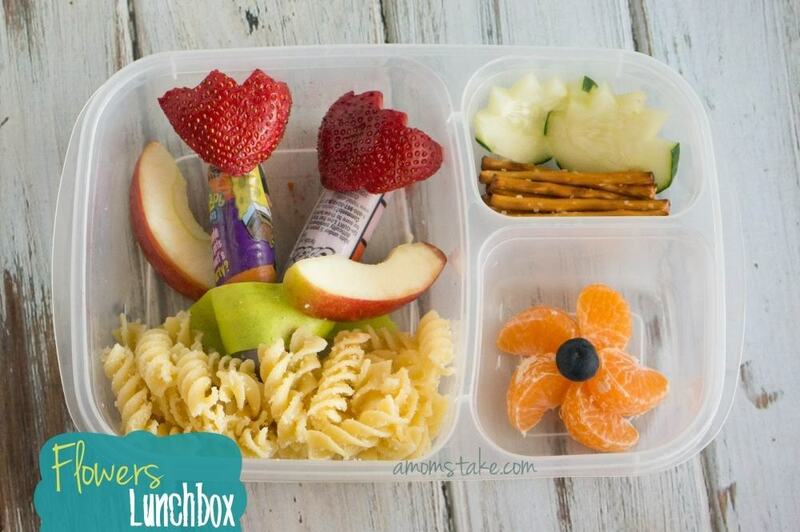 What adorable and yummy ideas to make lunch boxes fun! All great ideas! I especially love the brunch lunch and the taco salad lunch! YUM!! Lucky kids! These are such cute ideas! I love the Wild Thing lunchbox!